Welcome to our live blog from the College Station City Council’s workshop and regular meetings on Monday, Nov. 20. It’s not the official minutes. The workshop has started. Council took no action out of executive session. The council canvassed the Nov. 7 election returns and unanimously declared the results. Linda Harvell, Bob Brick, and John Nichols are elected to the city council. Harvell, Brick, and Nichols were sworn in as council members by Municipal Court Judge Ed Spillane. We’ll post photos here later. Council members, city staff, and citizens bid farewell to outgoing Mayor Pro Tem Julie Schultz and Councilwoman Blanche Brick, who each served two terms since their initial election in 2011. As a parting gift, Brick presented a large print of Norman Rockwell’s “Freedom of Speech” for display in city hall. The council will take a short break for a reception honoring the new and former council members. Councilman James Benham recognized Army Capt. Andrew R. Houghton as part of the Fallen Heroes Memorial program. The 25-year-old Houston native died Aug. 9, 2004, when a rocket-propelled grenade detonated near his vehicle in Ad Dhuha, Iraq. Christmas Parade Banners: The city has been approached about erecting and displaying seven banners at various locations from Nov. 21-Dec. 4 to recognize the annual Christmas parade. Banners may be exempt from regulations when they promote a positive image for the city that attracts business or tourism, depicts an accomplishment of an individual or group, or creates a positive community spirit. FY18 Certificates of Obligation: The FY18 Budget includes several Parks and Recreation, Public Works and Information Technology projects funded with certificates of obligation that haven’t been issued. The “Resolution Declaring Intention to Reimburse Certain Expenditures with Proceeds from Debt” would cover spending that is estimated to occur in advance of the scheduled FY18 debt issue. Greens Prairie Trail Project: The change order would reduce the contract for the Greens Prairie Trail Widening Project by $198,223.18. The project included reconstruction of Greens Prairie Trail from Wellborn Road through the intersection of Royder Road. Quantities actually used were less than estimated in the original contract. Banners for the annual Christmas Parade. A resolution declaring intent to reimburse certain expenditures with proceeds from debt for Parks and Recreation, Public Works and Information Technology projects in the FY18 Capital Improvements Program Budget. A reduction of $198,223.18 to the contract with Hassell Construction for the Greens Prairie Trail Widening Project. The $136,470 purchase of 15 traffic signal cabinets from Paradigm Traffic Systems. After a public hearing, the council voted unanimously to amend the city’s Unified Development Ordinance to recognize locational flexibility to ensure consistency among various master plan components and clarify that plan depictions may be updated as development occurs. The UDO is intended to implement planning policy as provided in the city’s Comprehensive Plan and associated plans. Since thoroughfare and bikeway alignments in these plans are generalized locations, the plans authorize discretion for those elements to be refined as needed up to a distance of 1,000 feet without an ordinance amendment. As part of reviewing thoroughfares for the proposed Thoroughfare Plan update, it was identified that several thoroughfares remain depicted as conceptually shown in the 2009 Comprehensive Plan, although development plans and surrounding conditions have provided refinement when implemented. After a public hearing, the council voted unanimously to approve an amendment to the city’s Thoroughfare Plan and Bicycle, Pedestrian, and Greenways Master Plan to reflect recent revisions to the Bryan/College Station Metropolitan Planning Organization’s 2050 Thoroughfare Concept. Mayor Mooney adjourned the regular meeting. The workshop meeting will resume after a short break. The council voted 6-1 to approve the Planning & Zoning Commission’s recommendations for changes to Suburban Commercial zoning as part of the 10-year update to the Comprehensive Plan. Councilwoman Harvell voted against the motion. Most current and future Suburban Commercial locations are located near neighborhoods along major highways and thoroughfares, which creates tension between neighborhood concerns and market demands for higher intensity. The council voted 5-2 against an earlier motion to approve the recommendations with the exception of gas stations and drive-thru establishments. Harvell and Councilman Brick voted for the motion. The council discussed the city’s bicycle parking guidelines and ways to increase development flexibility and reduce requirements. The consensus of the council, with the exception of Councilman Jerome Rektorik, was for staff to bring back an ordinance reflecting the recommendations. The council meets again on Thursday, Dec. 14. Friendly competition never goes out of style — especially when the competitors are still in diapers. On Saturday, Oct. 7, young crawlers, stumblers, walkers and runners from across the Brazos Valley will get together for the Toddler 2K and Baby Crawl at Wolf Pen Creek Park. The fun-filled event will also feature vendor booths and health and wellness activities that families can enjoy together. Youngsters will compete on their developmental level and will be divided by age into early crawlers, strong crawlers, early walkers, strong walkers, and toddlers. Crawlers and early walkers will have a short distance race with one parent or caregiver at the starting line and one at the finish line. Walkers and toddlers will compete in a 2K race and may be accompanied by a parent or caregiver. Participants will be given complete instructions after they check-in starting at 9 a.m.
College Station Parks & Recreation and Fit4Moms are also offering a free family workout from 9-9:45 a.m. Moms, dads, grandmas, grandpas, aunts, uncles and anyone else is welcome to participate and model healthy activities for the little ones. Children five-and-under must be kept in a stroller during the workout but will be entertained throughout. If you have not participated in a recent Fit4Moms class, please arrive early to complete a waiver form. The cost is $5 per child, and registration ends Oct. 5. Call 979-764-3486 for more information, or go to rectrac.cstx.gov to register. Virginia Godwin is in her fourth year as assistant recreation supervisor/youth services. A College Station native, she previously served as staff development specialist for Kids’ Klub, the College Station Independent School District’s after-school program. If you dream of performing on a live stage in front of enthusiastic and appreciative music fans, here’s your chance. The crowd-pleasing Voters’ Choice contest returns to College Station’s Starlight Music Series this spring after a successful debut in 2016. Bands and musicians over the age of 16 — and not signed under a promotional authority/contract — can enter for a chance to play at the May 6 concert at Wolf Pen Creek Amphitheater. Entrants must submit one song in an MP3 format along with a YouTube video of the song being performed. In College Station, the arrival of spring means more than warm temperatures, green grass, and blooming flowers. It also means the return of the popular Starlight Music Series on selected Saturdays at the Wolf Pen Creek Amphitheater. The free six-concert series opens April 8 and feature a variety of music to fit just about every taste. Since 2002, the City of College Station has invited citizens to enjoy family-friendly entertainment under the stars. The best parts are that it’s completely free and guests can bring refreshments. Food and drink are also available for purchase on-site. Guests are encouraged to bring blankets and chairs, and free parking is available at Post Oak Mall. We offer a KidZone area at each concert that features bounce houses and other activities from 6-10 p.m.
Join us this spring for six nights of free musical entertainment under the stars at Wolf Pen Creek Amphitheater! For more information, go to cstx.gov/starlight or contact us at parks@cstx.gov or 979.764.3486. Gerry Logan (@GL_sportsguy) is in his fifth year with the Parks & Recreation Department and has served as special events supervisor since 2014. He was previously the sports coordinator for the City of Clinton (Miss.) for three years. A native of Pontotoc, Miss., Gerry is a graduate student at Texas A&M after earning a degree in parks & recreation management from the University of Mississippi in 2010. The Texas A&M Quidditch team will participate in the 2017 Southwest Regional Championship on Saturday and Sunday at Veterans Park and Athletic Complex. Photo source: Facebook. Now that our Super Bowl buzz is finally wearing off, College Station is turning its focus to a lesser known sport – Quidditch. And it’s for the same reason Houston and every other major city in America want to host Super Bowls. Veterans Park and Athletic Complex will host the 2017 U.S. Quidditch Southwest Regional Championship on Saturday and Sunday, bringing in 21 teams from five different states. It’ll be the first major Quidditch event hosted at a City of College Station facility, and we hope it won’t be the last. Admission is free. Houston reportedly welcomed more than 1.3 million guests for the Super Bowl weekend, with economic impact estimates as high as $350 million for the entire metro. For one weekend, that’s pretty mind blowing. But Houston couldn’t do it alone. The state’s event trust fund paid $25.4 million to help build up to the big game, and Houston was asked to guarantee an impressive array of complimentary services. When Dallas bid for the 2011 Super Bowl, the trust fund awarded $32.1 million, and the city pooled its vast resources to win over the National Football League. What does this mean for College Station? Although College Station will never host a Super Bowl, Texas A&M’s collegiate events are the Super Bowl equivalent to our local economy. According to a recent study by A&M’s Division of Finance and Administration, Aggie sporting events and related campus activities attracted 1.3 million visitors and $385 million to the regional economy in 2013. The numbers for 2016 likely exceed those estimates. The City of College Station and Bryan College Station Sports & Events capture bids on a variety of sporting events each year that add significant value to our community. The successful bid to host our first U.S. Quidditch regional will not only spur the weekend economy, but it could also lead to additional opportunities for us to host more Quidditch tournaments. We expect the event to attract about 300 visitors who will spend money for two days on local hotel rooms, food, and entertainment. How do we land these events? College Station competes with other cities to host these types of events and the economic benefits they bring. But like Houston, we can’t do it alone. The U.S. Quidditch bid manual describes what the organization typically asks of a host community in incentives and services. While it’s no Super Bowl request, it requires host communities to commit a significant level of time and resources. The Parks and Recreation Department and Bryan College Station Sports & Events leveraged the Texas A&M Quidditch team’s participation in national and regional competitions to assemble our pitch. When it’s all said and done, these events will have attracted more than 50,000 visitors who injected $20-25 million into our local economy. Still not sure what to think? Come out to Veterans Park and Athletic Complex on Saturday or Sunday and see what sports tourism looks like in action. 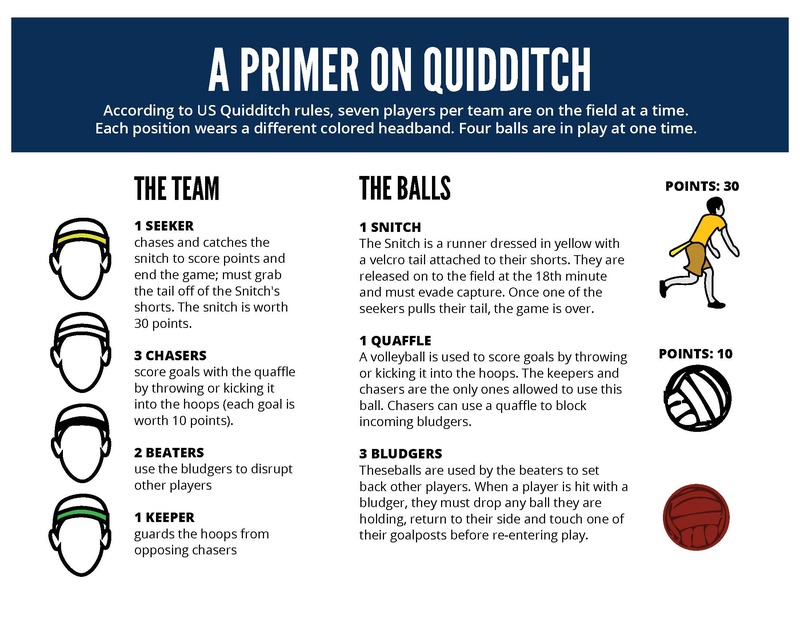 As a friendly gesture to fans and curious onlookers, U.S. Quidditch will conduct a free clinic on Quidditch Field 3 to teach kids and young adults about the sport. The clinics will last about an hour and a half and will start at 11:30 a.m. and 2 p.m. on Saturday, and at noon on Sunday. They’ll provide the equipment, too, so no need to bring your broomstick. We’ll see you this weekend at Veterans Park! J.D. Wood has been the City of College Station’s tourism manager since 2014 after serving as lead athletic supervisor for a year. His extensive experience in sports and tourism includes stints with the Dallas Convention & Visitors Bureau and Texas A&M Athletics. A native of Onalaska, J.D. earned his bachelor’s (2009) and master’s (2010) degrees in sports management from Texas A&M.